The Audioengine A2+ Powered Speakers are the reference standard for desktop audio and these small but high-performance speakers are the perfect upgrade for all your music. These small desktop speakers really pack a punch, making them the go-to system for desktop setups and smaller-room audio. 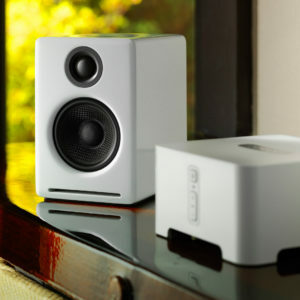 The A2+ Powered Speakers can easily be connected to your computer, tablet, phone, or turntable. Clear, full and powerful audio ideal for your desktop and smaller rooms. The A2+ Desktop Speakers are constructed with custom Audioengine components: aramid fiber woofers, silk tweeters, and built-in power amps wrapped in precision tuned, hand-crafted cabinets. The bass was teased from the A2+ with some clever acoustic and electrical design without using any digital signal processing or fake bass boost circuits. To say the bass on the Audioengine 2+ is substantial for their size may be an understatement, but you be the judge. 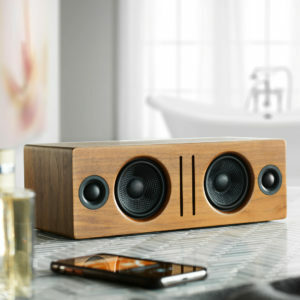 The A2+ Powered Speakers have amassed a vast collection of awards from the likes of WIRED, Sound & Vision, Gizmodo, The Absolute Sound, PCMag, and many others. What makes A2+ so special? Find out for yourself. Can I use the A2+ USB input with tablets or smartphones like Samsung Galaxy or Microsoft Surface? Yes. If your tablet or smartphone has a USB output and supports USB audio (refer to the manufacturers’ documentation), then it will work with A2+'s USB input. For smartphones you'll also need an OTG adapter cable to connect from your tablet to the USB input on the A2+. These are generally available from the manufacturer of your tablet/smartphone, local electronic stores, or even online retailers. Do the A2+s have an auto-sleep, idle, or auto-power-off function? Can I leave them on all the time? The A2+ is equipped with a power-saving circuit that turns off the final stage of the speaker's amplifier when no input signal is detected, so you can absolutely leave them on when not in use. This activates right after you stop playing music, and is instantaneous (as soon as the input signal stops and it disengages automatically once an input in reintroduced), so there shouldn't be a noticeable delay when resuming audio. It's also fine to power off your speakers when not in use if you prefer. Can I have more than one source connected to the speakers? If I have 2 inputs plugged in at the same time, how do I switch between them? Absolutely! Audioengine self-powered speakers include multiple analog inputs (in addition to digital inputs like USB, optical, or Bluetooth). These analog inputs are "open," or active, meaning there isn't any sort of switching built into the speakers; if both sources were playing while connected to the speakers, both would be audible. This makes it so you can leave 2 analog audio sources plugged in at the same time with no need to flip any switches! Since the A2+ already has a built in DAC, does that mean I cannot use another one? While the DAC in the A2+ is better than what might be built in to most computers, adding a 24 bit DAC, like our D1 or D3, would still be a benefit to audio quality. Nope! Audioengine powered speakers have amplifiers built-in. This means you don't need any extra equipment, other than a source to play music on (smartphone, / tablet, a computer, CD player, Turntable, Etc). Just plug your source directly into the inputs on the rear panel of the left speaker with the included cables, and you're listening to music! Yes. You will need to pick up the USB Camera Adapter from Apple, which allows a USB connection to the iPad (and, as of iOS7, the iPhone). Then just hook up as you would from a computer. Sure! You will need about 100-120 watts. 5mm x 20mm - 1.6 amps @ 250 volts. The power cable is detachable on our powered speakers which makes it convenient to replace the AC plug with a different type if you don't want to use an adapter plug. Our woofers are made of aramid fiber and the tweeter domes are silk. Both of these materials are very robust and can handle quite a bit, therefore we decided against grill covers as they tend to negatively color the sound. Even though our speakers do not have grills they are still cat and kid-friendly! All you would need to do is connect the variable output of the A2+ into the input of your sub using RCA cables. Can I control Audioengine speakers with my TV remote control? What if my TV only has one audio output that cannot be controlled with the TV remote? Although many TVs have only one L/R audio output, which typically defaults to fixed, this setting can be sometimes be changed via the on-screen menu so please check your manual to see which outputs are variable. If your TV has multiple audio outputs, the most commonly variable output would be the headphone output. If your TV doesn't have a variable output at all, no worries; for larger speakers like the A5+ and HD6 we include a remote control that can adjust the volume of the speakers directly for just such a purpose. Does A2+ come with speaker grills? The A2+s do not include detachable magnetic grills. Due to the electronics, cabinet materials, and high-end finish it's not a good idea to drill into your speakers; however, we have provided a 1/4" threaded insert to use with wall mounts. Please note that this insert is only meant to be used for stability with platformed stands that have this feature; the insert is not meant to hold the total weight of the speaker. We don't endorse any specific models of stands. Even though the final amp stage is shut down during sleep, the pre-amp stage is still powered up so a slight hiss is not uncommon. If you have an analog audio cable plugged in to the speakers but not into anything else, it's also possible this could be picking up some noise as well. Some computer headphone outputs are noisy and have poor audio quality. If this is your computer, try streaming wirelessly to your A5+ Wireless. Or, check out our D1 or D3 wired DACs for 24-bit playback. How do I use my W3 wireless adapter with the A2+ powered speakers, since they don't have a USB power plug built into the speakers? Plug the W3 AC Power Supply (one adapter is included with the W3) into an AC outlet, connect the W3 Receiver into the adapter, and run the mini-jack cable from the Receiver to the A2+'s. If you're not using your W3 transmitter with a computer, and need a second power supply for your setup, you can find extra power supplies here. You can also use spare USB phone or tablet chargers to power the W3, just make sure they can supply at least 500mA. Our powered speakers are an all-in-one solution with no extra amps or components needed! All you need to do is unpack the speakers, place them where you want, and then plug in the AC cord. Next, connect the included speaker wire from the active speaker to the right passive speaker. Then plug in your music (iPod, CD player, computer, etc.) with the supplied cables and you're ready to go. Can I take my A2+s to another country with a different voltage? If I connect my turntable to the A2+ will it be necessary to purchase a phono preamp or can I simply connect the turntable directly to the A2+ input? Some turntables will need a preamp before being connected and others may have one built-in. With that in mind, it is best to check the turntable manufacturer’s website, the turntable’s user manual, or you can even try your turntable without the preamp first to see how it operates. Can I use a power inverter with my A2+? Sure, for A2+ you will need an inverter that can supply about 50-60 watts. When I connect a turntable to my A2+, why is the volume extremely low? Some turntables do not have a built-in preamps and as a result you will need to add an external phono preamp between your turntable and the A2+. Many turntables, however, (such as the Music Hall USB-1 or Audio Technica AT-LP120) have a built-in preamp and include a switch on the back for "line" or “phono”. For Audioengine powered speakers select "line". Should I use the volume control on the rear of the A2+s or can I adjust from system volume on my computer? There are a few notable differences but both designs function basically the same. “Active” and “powered” speakers refer to speakers with power amplifiers built into either one speaker or both. Audioengine speakers were designed with the power amps in the left speaker to make connections easier as they only require one power cord and all connections are on the same speaker. If I connect my Audioengine speakers to a computer, smartphone, or other music player, what volume level should I set on the player and speakers? What is the ideal overall volume level on the music source to get the cleanest distortion-free sound? Every setup is different, so some experimentation will be necessary to find your prefered settings, but around 11 or 12 o'clock is a good starting place if you plan on using your music source (smartphone, computer, TV, etc.) as the master volume control. Can you stream music wirelessly to the A2+ with the Audioengine wireless adapters like you can with the A5+ Classic? In the new A2+, we've included a linear limiter which will manage the bass at the point where bass distortion starts to occur. Being a linear limiter, it will not chop the signal but instead retains the shape of the waveform, not allowing it to go into distortion. This means if you listen to the A2+ at higher levels you'll notice the bass response is tamed and not as boomy. It’s important to note that the limiter will have no effect at normal listening levels. Some people want to upgrade the audio on their TV's but aren't necessarily interested in surround sound. Can I hook up some Audioengine speakers to my TV instead of buying a surround sound system or soundbar? Audioengine speakers can be easily connected to the audio output on your TV set. Any of our speakers will provide an easy setup and a greatly enhanced TV audio experience with a wider soundstage and better imaging than most sound bars! Can I use my headphones with the A2+s? You wouldn't be able to use a pair of headphones directly with the A2+s; in order to use headphones with the A2+s, you would need to include something with a dedicated headphone amp, such as our D1. All you would need to do is plug the D1 into your computer (either with an optical or USB cable) and connect the D1 from its RCA outputs into either of the inputs of your speakers.